South Korea and Russia share the common goal of denuclearizing the Korean Peninsula, which will lead to the joint development of not only the countries but the entire region, South Korean President Moon Jae-in said Wednesday. Moon's remarks came in an interview with Russian news outlets ahead of his three-day state visit to Russia that will begin Thursday. "President (Vladimir) Putin and I share the vision of peace and joint prosperity in the Eurasian continent," Moon said, according to a full script of the interview released by his office Cheong Wa Dae. "Also, the New Eastern Policy that Russia is pushing ahead for its economic development and the New Northern Policy that I am preparing to help secure our new growth engine have many similarities. And the countries are the most important partners to each other. I wish to discuss ways to further enhance our cooperation in such areas," the president said of his upcoming summit with the Russian leader. Moon and Putin are scheduled to meet Friday for their third bilateral summit since Moon took office in May 2017. They first met on the sidelines of the annual Eastern Economic Forum hosted by Russia in Vladivostok in September. Moon's first trip to Moscow follows a flurry of international efforts, including two inter-Korean summits and a US-North Korea summit, to rid North Korea of its nuclear ambition. Commenting on the historic US-North Korea summit held in Singapore last week, the South Korean president said it was more successful than he had hoped. "Now the North and the US have removed their long hostile relations and made a historic transition toward a new peace system. As specific ways toward that goal, North Korea promised complete denuclearization and the US promised security guarantees for North Korea. I think what is left now is how completely and swiftly we implement such a wonderful agreement," he said. When asked about his impression of North Korean leader Kim Jong-un, Moon said he was a very young leader, who is calm, honest and very polite. Moon and Kim first met at the border village of Panmunjom on April 27, marking the first inter-Korean summit in more than a decade. They met again on May 26 on the North Korean side of Panmunjom that sits directly on the inter-Korean border. The South Korean president said he and his Russian counterpart shared a common goal of peacefully denuclearizing the Korean Peninsula. "President Putin and I also share the common goal of completely denuclearizing the Korean Peninsula and establishing a peace regime," he said. He stressed the importance of economic cooperation between his country and Russia. "Once a peace regime is established on the Korean Peninsula, that is when an era of South-North economic cooperation will take off in earnest and I believe it must be a three-way cooperation that includes Russia," he said. Moon insisted his country and Russia could, or should, begin expanding their economic cooperation in areas including railways, natural gas and electricity, so the North can join later. "In case of railways, when those of South and North Korea are connected and that cross-border railways are linked with Russia's Trans-Siberian railway, direct shipments of goods from South Korea to Europe will be possible," the president said. "This will be a great economic gain to North Korea, as well as South Korea. And of course, it will be a great help to Russia, too." "Also in case of Russian gas, Russia's natural gas can be supplied to North Korea through a gas pipeline, and to South Korea, and to Japan through a sea underwater pipeline," he added. During his three-day visit, Moon is also set to meet with Russian Prime Minister Dmitry Medvedev. 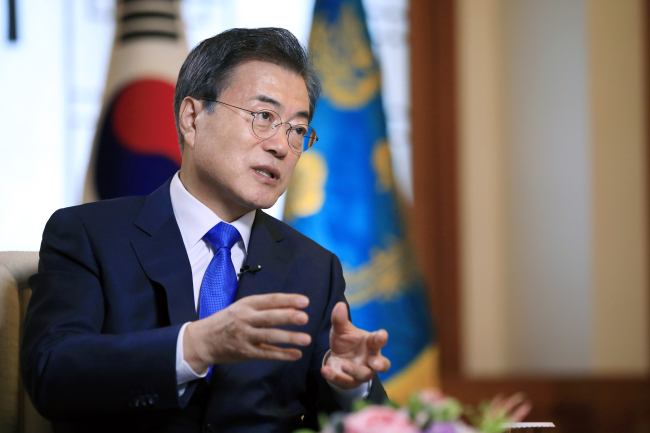 He will deliver a speech at the Russian State Duma, becoming the first-ever South Korean president to do so.